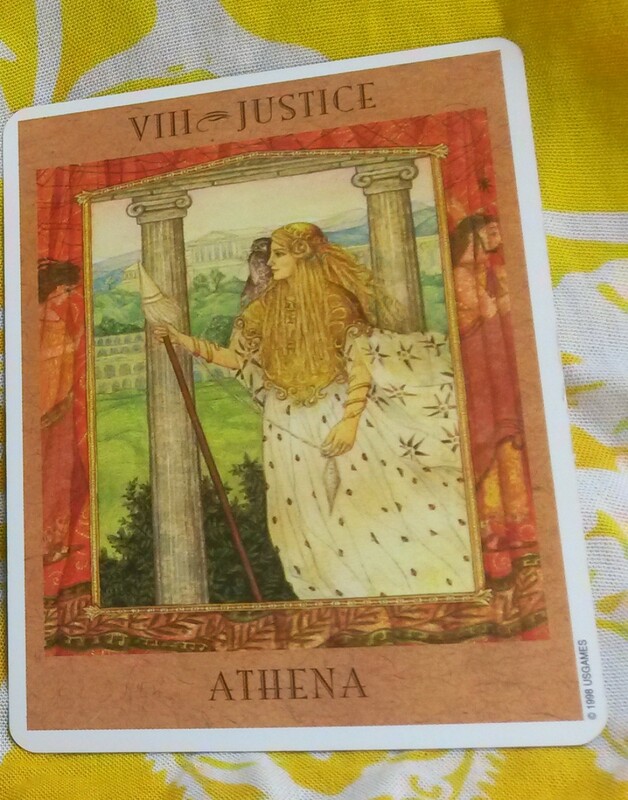 The picture of my first and last and only “Tarot of the Day” attempt as I first intended. I recently tried to implement some sort of “Tarot Fix of the Day” post to my facebook page and was heavily disappointed, and I finally figured out why. It wasn’t that facebook insisted on posting my picture sideways. 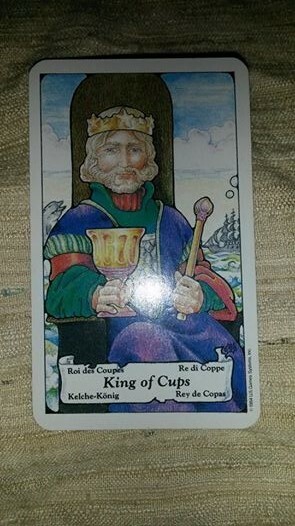 It isn’t that my first card was the King of Cups, who, despite the many positive implications of that card, I can’t help but read as a negative card; he’s a slippery fish who can’t get his crap together with a Poseidon like temper despite being extra sensitive and hugglable no matter how it lays. I was disappointed because I realized I felt pressure to join a bandwagon. So many blogs here and so many pages offer “Tarot Card of the Day” posts that I think it has finally become hackneyed. I see the use in them. I get confused because there are so many different ones. I realize that they are exactly like daily horoscopes that I read all the time. I guess I want to feel different, and that’s okay. On my personal facebook I’ve offered “Stone of the Day” posts, and “Happiness Moment of the Day” posts when I felt like it. I got some very positive feedback that I really helped cheer some people up. I really prefer to do happy things as a way to set up someone’s day instead of having the chance that the 10 of swords pops up and have to ruin everyone’s happy dance before 8am. Instead, just like I do on my facebook, I’ll post a thought, a quote, or something I really feel like I want to share with my Tarot community. I really don’t have any stranger regulars at this point, and that’s fine with me because I still like sharing my views, tips, and fun stuff about Magick to anyone who will listen. The money, as I’ve said before, is to help limit my energy chains. On a mundane level I plan to put in a savings box so I can make it to the beach next year as I haven’t been since 2011 and I absolutely LOVE the beach. I don’t feel the need to satisfy “customers” but to entertain READERS [both meanings intended] and to discuss magickal topics. Reading at the shop is one of the highlights of my week and I absolutely LOVE to do it! But don’t expect any more posts involving me telling you what to do when you wake up in the morning. The day is what you make it, so make every day wonderful.